Benoît Mandelbrot passed away on 14 October 2010, and will be largely remembered as the founding father of fractal geometry. Mandelbrot was Professor of Mathematical Sciences at Yale University and he obtained several accolades in recognition for his contribution to mathematics, not least the Wolf Prize in 1993 (Lesmoir-Gordon, 2010). Mandelbrot’s revelations made it possible to see mathematically produced fractal images, which had many implications for mathematics, medicine, physics, psychology and the arts. Here we consider not only his contribution to mathematics, but also to psychology. Born in Warsaw, on 20 November 1924, Mandelbrot’s upbringing was by no means conventional. His mother, like many of the women in her family, was a doctor, and his father, a businessman, was himself from a family of academics (Mandelbrot, 1998). As a result the young Mandelbrot was inspired by his intellectual family and their peers. Mandelbrot received his first two years of education from his uncle Loterman, who Mandelbrot described as ‘very cultured’ (Mandelbrot, 1998). Mandelbrot did not learn the alphabet officially, nor the times tables after multiplications of five (Al-Khalili, 2010), but he was taught how to read maps, play chess, and how to argue and debate. Mandelbrot and his family would later move to Paris when he was 11, where he would benefit greatly from the inspiration of his uncle Szolem Mandelbrot, a successful mathematician at the time (The Telegraph, 2010). An outstanding chess player, he would later say that he perceived the game geometrically rather than logically (Lesmoir-Gordon, 2010), and his fondness for geometry was stimulated by his father’s interest in maps, many of which adorned the family home. Following the war Mandelbrot’s uncle Szolem showed him a mathematical problem linked to the work of Julia and Fatou on what are termed self-similarity and iterated functions. His uncle explained that the problem had mystified mathematicians for many years and that it would make the young Benoît’s career were he able to find anything new. And so it was that Mandelbrot began to deconstruct the problem in the hope of unveiling a fresh approach. Mandelbrot had an impressive gift for observing concealed patterns within nature; where some saw chaos Mandelbrot saw structure and rules. He often referred to this structure as ‘the roughness of beauty’. By subjecting organic shapes to mathematical analysis, Mandelbrot tamed the wild beauty of nature by generating new, principle-based, shapes that people have found beautiful. Mandelbrot had ‘big dreams’, but his dreams were constantly under threat during the Nazi occupation of France (Mandelbrot, 2010). In the wake of the Second World War Mandelbrot was able to attend college entrance examinations. His exemplary results won him a scholarship at the École Normale and then later the École Polytechnique. Mandelbrot would later gain a master’s in aeronautics at the California Institute of Technology. In 1952 Mandelbrot furthered his academic pursuits in Paris, where he obtained a doctorate in mathematics. Following a further stint in the US, this time attending the Institute for Advanced Study, Princeton, Mandelbrot returned to France where he married Aliette Kagan. It was during this period that Mandelbrot obtained a professorship at Centre National de la Recherche Scientifique in Paris. Between 1956 and 1958 Mandelbrot was having difficulty deciding which research route to pursue; he was torn between the study of social sciences or physics. It was at this point that Mandelbrot met Jean Piaget. Piaget was searching for ways in which to examine logic in children, but was in need of an approach that had a sound, scientific basis. Mandelbrot appreciated that Piaget wanted mathematics to become engrained within psychological research. And so it was that for the following two years Mandelbrot worked closely with Piaget in Geneva as an assistant professor of mathematics, developing their scientific perspective of organising logic into a coherent measure. 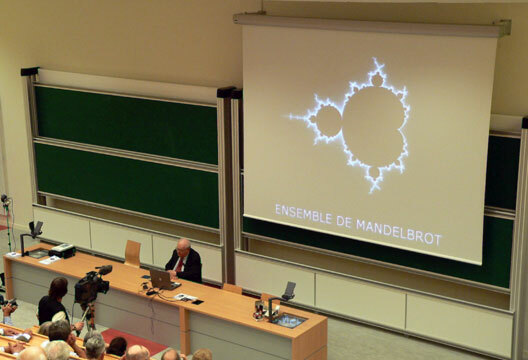 Mandelbrot even authored the third volume of Piaget’s ‘Études d’epistémologie génétique,’ entitled Logique, langage et théorie de l’information (1957, in Battro, 2010). It was whilst working with Piaget that Mandelbrot became interested in determining what he termed the ‘informational temperature’ of written text, via the utilisation of fractions as a way of categorising relevant data (1957, in Battro, 2010). Though it would be many years before Mandelbrot would refine his fractal theory, his early work in Geneva was indicative of his subsequent investigations of frequencies and their practical applications. Mandelbrot’s characteristic intellectual itchy feet meant that it was not long until he had given up this post in favour of the position of faculty visitor at IBM in 1958. Mandelbrot’s duties included analysing seemingly random transmission noise from between computer terminals. What he discovered would help establish his entire body of work; the noise was not in fact random; there was order to be found among the chaos (Lesmoir-Gordon, 2010). As an employee of IBM, Mandelbrot would study the irregularities of financial markets (Al-Khalili, 2010). It was then that Mandelbrot had his eureka moment, he found strong traces of order within the roughness (Mandelbrot, 2010). For centuries mathematicians had analysed shapes that conformed to Euclidian rules, overlooking shapes that, for the most part, govern our natural world. Mandelbrot felt that it was preposterous that there was no formal method of measuring or describing shapes that occurred organically. What Mandelbrot proposed was truly radical: that diverse shapes found occurring organically in nature, such as coastlines, clouds, trees and so on, share a common mathematical feature. Mandelbrot suggested that the fundamental essence underpinning shapes lay the concept of self-similarity, and thus Mandelbrot returned to a very old mathematical problem first suggested to him by his Uncle Szolem and developed the formula for the Mandelbrot set. The beauty of the Mandelbrot set lies not only with its striking appearance but also within the simplicity of the equation that created it. In 1919 Hausdorff introduced a number (D), seen by many as a mathematical joke. The number allowed dimension to be a fraction. Mandelbrot found this number to be a good measurement of roughness. Mandelbrot described the equation as ‘so simple, so dry, so uninteresting’ (Mandelbrot, 2010). The equation (Z[new] = Z[old]2 + C) has a distinctive property in that it feeds back on itself. The resulting feedback makes for an image of infinite complexity. Self-similarity comes in two forms: exact and statistical (Taylor, 2010). The form that has been of most interest to psychologists, statistical self-similarity, is usually found in organically occurring patterns; though the statistical qualities of the fractal pattern repeats, the pattern itself does not repeat precisely. The underlying principles of self-similarity saw Mandelbrot devise the concept of fractal geometry. Statistical self-similarity can be found in both nature and in paintings. Exact self-similarity sees a pattern repeating on the finer scales exactly. These fractals are typically created artificially and mathematically using computer software (see opposite). The non-chaotic generation of exact fractals are rarely seen in nature, with the exception of crystallised forms such as snowflakes. As the creation of such fractals follow two basic principles (i.e. the shape of a pattern, and how to repeat said pattern), mathematicians have been able to synthetically create their own exact self-similar fractals. In most cases the initial shape of the pattern is called a ‘seed’ or ‘initiator’ and the law used to repeat the pattern is galled the ‘generator’ (Taylor, 2010). An example of the development of exact self-similarity can be seen in the Sierpinski triangle (above). The analogy of the cauliflower best describes fractal patterns (see over). Mandelbrot surmised that a floret cut from the cauliflower retained the same basic structure of the original cauliflower but much smaller; each section it similar to the whole. Such short rules dominating geometry were appealing to Mandelbrot; through this repeating formula it was possible to generate artificial patterns, the only natural element of which being roughness (Mandelbrot, 2010). With the discovery of the fractal came innumerable practical uses. Set designers, used to spending long days labouring over a painted mountain scene could now, with the manipulation of computer software, quickly create artificial landscapes varying in complexity. Anatomists were able to model the structure of a human, developing understanding of lung volume and how its fractal structure could explain similarities in mammals of varying sizes. Fractal analysis has even been utilised as a novel way of deepening or understanding how blood is dispersed throughout the body (Mandelbrot, 2010). Studies have found the pulmonary blood flow of dogs and sheep to be fractal in nature, suggesting similar fractal patterns within our own cardiovascular system (Barman et al., 1996). The abstract expressionist Jackson Pollock captured the essence of organically forming shapes on his canvases through pouring and dripping liquid paint, but there were concerns over how to determine the authenticity of what was essentially a sophisticated pattern of splashes and drips. Taylor et al. (2007) examined film footage of Pollock at work and concluded that Pollock was generating paintings with a high fractal dimension (D). In addition Pollock was able to fine-tune the structure of his paintings, gradually increasing their fractal complexity over a 10-year period. Taylor was able distinguish Pollock’s work from a selection of non-Pollock drip paintings via fractal analysis. Unlike a genuine Pollock, non-Pollock paintings did not display self-similarity at finer magnifications (Taylor, 2002). Fairbanks and Taylor (2010) also report that humans have a preference for fractal patterns in the 1.3 to 1.5 range. Fractals of a lower dimension or higher dimension are not preferred. This work was somewhat supported by Forsythe et al. (2011), who found that fractal dimension accounts for a small percentage in the variance of aesthetic experiences, particularly when pictures are representative of something in the natural environment. The 1.5 fractal dimension may also be useful as a survival tool. Animals may favour mid-range fractal foraging behaviour, as the specific fractal trajectory allows for maximum foraging coverage over any specific vicinity, making the best possible use of a vast area. This in turn saves energy, an essential resource in the wild and enhances, for example, the albatross’s chances of a successful hunt (Viswanathan et al., 1996). By the latter half of his career Benoît Mandelbrot had earned a reputation as the founder of fractal geometry. Somewhat of a maverick, Mandelbrot leaves behind a legacy that permeates our everyday lives. A rare breed of mathematician, Mandelbrot made his work accessible and fun. When he passed away, an artist, scientist and great visionary went with him also. Al-Khalili, J. (2010). The secret life of chaos. BBC 4 documentary last broadcast on 25 March 2010. Barman, S.A., McCloud, L.L., Catravas, J.D. & Ehrhart, I.C. (1996). Measurement of pulmonary blood flow by fractal analysis of flow heterogeneity in isolated canine lungs. Journal of Applied Physiology, 81(5), 2039–2045. Fairbanks, M.S. & Taylor, R.P. (2010). Measuring the scaling properties of temporal and spatial patterns: From the human eye to the foraging albatross. In S.J. Guastello & R.A.M. Gregson, Nonlinear dynamical systems analysis for the behavioral sciences: real data. New York: Taylor & Francis. Forsythe, A., Nadal, M., Sheehy, N. et al. (2011). Predicting beauty: Fractal dimension and visual complexity in art. British Journal of Psychology, 102, 49–70. Taylor, R.P. (2002, December). Order in Pollock’s chaos. Scientific American, pp.117–121. Taylor, R.P. (2010). Chaos, fractals, nature: A new look at Jackson Pollock. Eugene, OR: Fractals Research. Taylor. R.P., Guzman, R., Martin, T.P. et al. (2007). Authenticating Pollock paintings using fractal geometry. Pattern Recognition Letters, 28, 695–702. The Telegraph. (2010, 17 October). Science obituaries, Benoît Mandelbrot. Telegraph.co.uk. Viswanathan, G.M., Afanasyev, V., Buldyrev, S.V. et al. (1996). Lévy flights search patterns of wandering albatrosses. Nature, 381, 413–415.